Hepburn was born at Douds, a settlement in New Bight, Cat Island, and after completing his early education, he continued his studies in the United States where he received the B.A. and M.A. degrees.He holds a Ph.D in Comparative Language and Literature from the University of Madrid and a Diploma in International Relations from Switzerland. - O.B.E. from Her Majesty the Queen. 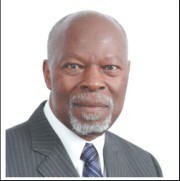 He served as Chairman of GGYA, AAMC and is Co-Patron of the Primary School Programme, and served for many years as Ambassador of Bahamas to the United Nations and later as President of the 35th Session of the UNESCO Conference from 2009-2011. He is the husband of Dr. Ada Thompson. He has one son and two lovely grandchildren.